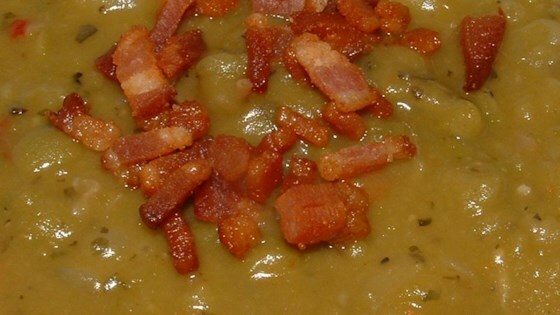 "Here's a rich and hearty split pea soup with a twist. Since the peas do not need to be pre-soaked, it can be put together quickly and easily. For a little added smokiness and spice, dice up a couple chipotle peppers in adobo sauce, and add them with the other herbs and spices." Heat the oil in a large pot over medium-high heat. Cook the onion in the hot oil until translucent, about 5 minutes; stir in the garlic and cook another 30 seconds. Pour in the beef broth; add split peas, carrot, potatoes, soy sauce, basil, black pepper, parsley, red pepper flakes, sage, kosher salt, and bay leaves. Place the smoked turkey legs into the pot and pour in enough water to cover the peas by about 1 inch. Push the meaty ends of the turkey legs down into the liquid. Bring to a boil, cover, reduce heat to medium-low, and simmer until the peas have softened, about 45 minutes. Remove the turkey legs from the soup and set aside to cool. When cool enough to handle, strip the meat from the bones and tendons, finely chop the turkey meat, and set aside. Using a stick blender, puree the soup to your desired degree of smoothness. Stir the turkey meat back into the soup. Ladle into bowls and top each with a dollop of sour cream. This is a very flavorful soup but rather than six cups of beef broth try six cups water with two tablespoons of ham base. There are several delicious varieties sold in jars. Great Recipe! I used chicken broth instead of beef. This was one of the best soups I have ever had!